Since I build datacenters I need to verify performance and you can do that using SQLIO. 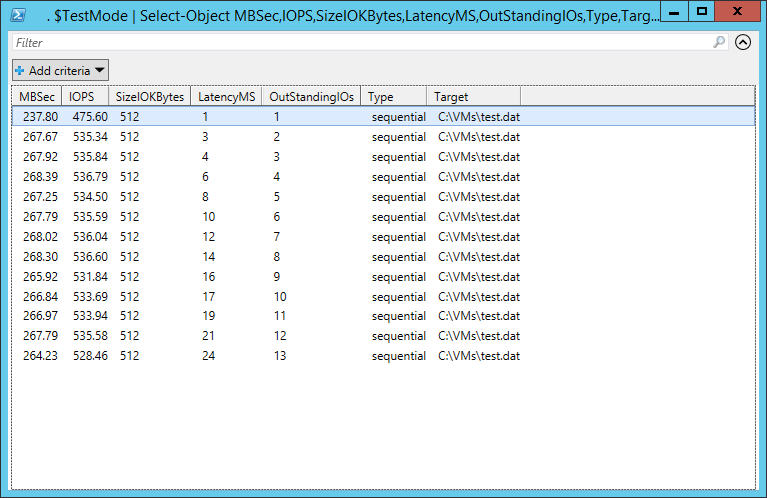 But there is a lot of parameters, a lot of typing and to make testing a bit more consistent I was reading Jose Barreto’s blog http://blogs.technet.com/b/josebda/archive/2013/03/28/sqlio-powershell-and-storage-performance-measuring-iops-throughput-and-latency-for-both-local-disks-and-smb-file-shares.aspx and that gave me inspiration to create a PowerShell script that is a bit more complete and here you can see the result of it. We use this to measure performance on local disks, SMB storage, Storage Spaces, SAN storage, iSCSI storage, basically everything, now it is easy to “spot” the issue, since we have seen the numbers so many times. Output sample in table format. The script it is rather easy, it is basically a wrapper for SQLIO.exe but it gives you an output as a table or in a grid. 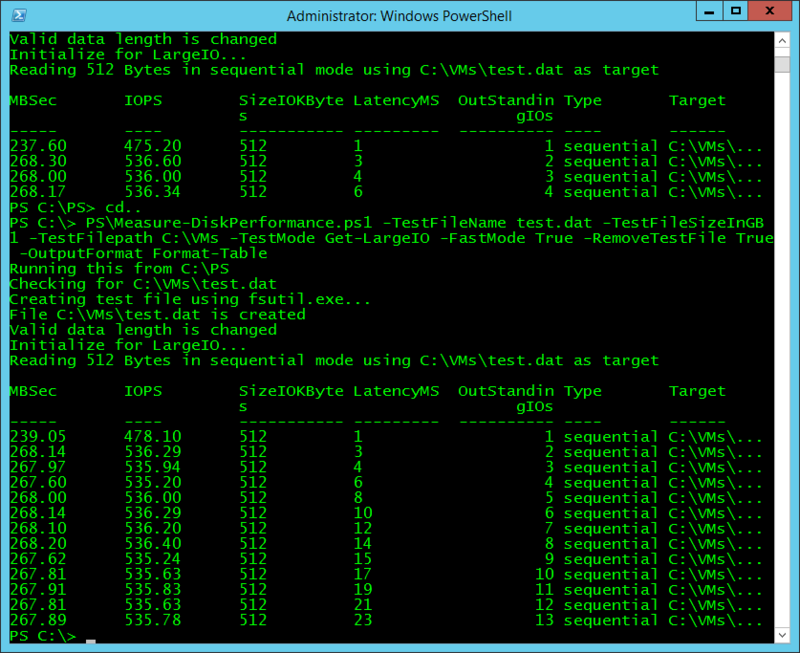 There is two options to measure workload, you either measure IOPS or Transfer rate. The folder, can also be an UNC path, it will create the folder so it does not need to exist. TechX–Azure In Sweden next week!–Don’t MISS it! Powershell Por Vida! Another excellent post from Mikael Nystrom! Can this be used on CSVs as well? Any limitations? Thanks will test it out soon. Much appreciated. Could this script be used to measure disk performance inside a Virtual Machine ? Or is just for Hyper-V hosts ? Tips for measure diskspeed inside a VM? Yes, we use it inside VM as well..
Ok, great! What is “normal” values for different types of disksetups (SSD, SAS-Mirror, SATA-III ? would be great with som kind of list. I Ran the script within a VM where the vhdx is on SATA-3 mirror (storage spaces in 2012 R2) and got 7000MB and 13000 IOPs. That could not be correct I think? Runing on the host towards the same storage got me around 90MB and 200 IOPs. And towards a SSD-storage got me 535 MB/Sec and 1050 IOPs on the same host. Have you found 5 minutes to spare, so that you could upload that other script for better testing disk performance inside a VM? Awesome script! As Anders said, you get that script for testing within a VM uploaded? Would be great to see that other script once you have uploaded it. I also have a requirement for testing against different types of storage. Method invocation failed because [System.Object] doesn’t contain a method named ‘Split’. any advice on to resolve the error? Hope it will be useful for everyone. I ran into the same problem while doing some testing of my own. I think that it was a powershell version issue and that the resolution was to remove the first split (.Split(“`n”)), it seems that the output already was delivered by line. Pingback: Azure D-Series VM Benchmark - Do you IT? I just had to share this. Great script, valuable resource indeed! You are either running the script inside ISE or you are running an old version of PowerShell. Ah scripting environment, yes I recall having to enable this feature within 2008 R2 to get the script to even run. How would you suggest running it? What if i want to run this for a long period of time ? Say 3 days and get results summing up the iops need ? run the script using a script and repeat? activity or more complex, variable access patterns. The SQLIO download has been pulled by Microsoft and replaced with a Readme.PDF which says ‘The SQLIO Disk Subsystem Benchmark Tool has been retired and replaced by DiskSpd.exe.’ Bummer.